On Sale !!! Badgemaker 32mm Button Kits for Sale - While Stocks Last! This is a very rare event when I go on sale on Badge Makers but it is happening now. On sale are badgemakers for size 32mm (1-1/4") buttons and both styles comes with free regular pinback buttons. What a great way to start making buttons with the handpress and/or the bench press machines. 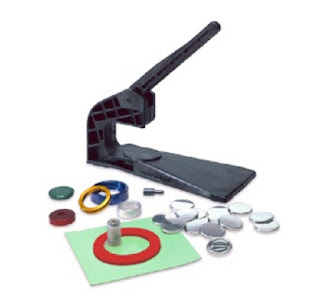 (1)This Badge-A-Minit (USA) handpress button kit comes with (1) 1x - Hand Press (2) 1x - Adapter (3) 1x - 1-1/4" Assembly Ring Set (4) 1x - 1-1/4" Cut-A-Circle and (5) 250x - 1-1/4" Pin-back button sets and sells for $99.95 now. Click on the image below or click here to check it out. 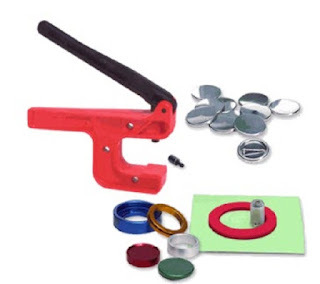 (2) This Badge-A-Minit (USA) benchpress button kit includes (1) 1x - Bench Press (2) 1x - 1-1/4" Assembly Ring set (3) 1x - 1-1/4" Manual Cut-a-Circle and (4) 250x - 1-1/4" Pin-back Button Sets and now on sale for $169.95. Click on the image below or click here to check it out. They are great for school activities, fund-raisers, business promotions, birthdays and anniversaries or just to greet someone or make someone's day with a button. Make someone smile with a button! And what is good about it is that you can make any button you like anywhere you are. Could be in the comfort of your own home, in the backyard, everywhere !